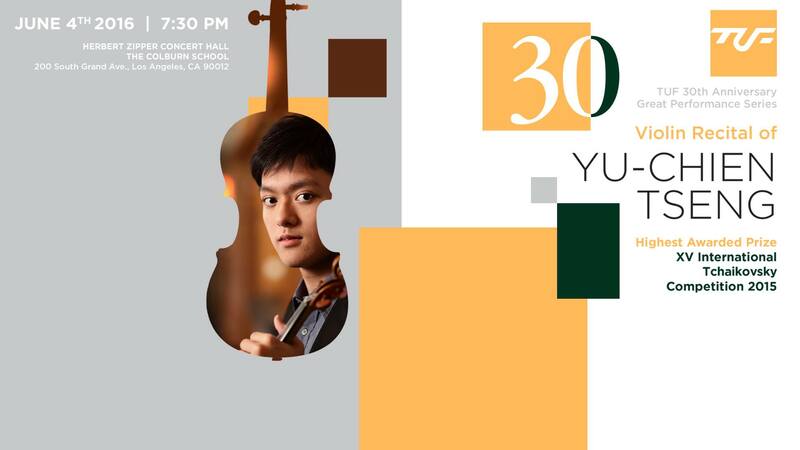 Taiwanese United Fund (TUF) is proud to present a performance by Yu-Chien Tseng, the young Taiwanese musician, awarded the highest prize in the XV International Tchaikovsky Competition in 2015. Yu-Chien Tseng was born in New Taipei, Taiwan. He started to study the violin at the age of 5. By the age of 6, he had already performed with the Taipei Symphony Orchestra. In his native Taiwan, he studied with Po-Shan Lin, Ying-Liang Shen, I-Ching Li and C. Nanette Chen. Since 2008 he has studied at the Curtis Institute of Music, under professors Ida Kavafian and Aaron Rosand. In 2009 he won the 10th Pablo Sarasate International Competition in Pamplona (Spain). In 2011 he won the Isang Yun Competition in Tongyeong (South Korea) and also was awarded a special prize at the XIV International Tchaikovsky Competition (as best of those in Round II who did not make the finals). In 2012 he took fifth place in the Queen Elisabeth Competition in Brussels. He has performed with the Philadelphia Orchestra, the National Orchestra of Belgium, and the symphony orchestras of Singapore, Taipei, and Navarra among others. He has given solo concerts in cities in the US, Europe and Asia.